Most people think of butterflies and moths as part of summer's beauty, but these insects must survive the winter somehow for the species to survive. Different species handle the cold months in various ways, but some spend their winters as caterpillars. They typically enter a form of hibernation to stay alive until spring. Some butterflies time their egg laying so the caterpillars will be newly hatched as the weather starts to cool. Butterflies such as the common wood-nymph lay eggs in the fall. When the caterpillars hatch, they don't even take time to eat. Instead, they burrow into the soil under the nearest plant to create a nest to help protect them from the harsh weather. They enter a state of hibernation, only digging free when the weather warms enough that the plants are leafing out and ready to eat. The life cycle of some caterpillars, such as the white admiral, starts earlier in the summer, but they don't quite have time to make it to the adult stage before the cold weather hits. These mid-size caterpillars have started growing, but they aren't finished. They find a protected place to rest and enter a type of hibernation called diapause, where their body functions decrease and their growth pauses until they wake. Many wrap themselves in leaves or other organic matter, holding it in place with silk for extra protection. They don't metamorphose in these wrappings; they aren't actually cocoons or chrysalises, but they sometimes resemble them. 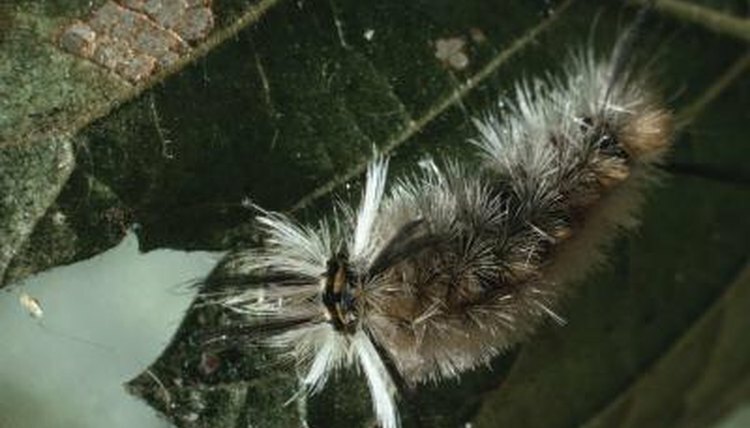 Caterpillars who hatch in the summer often have time to mature during the warm season. Some have time to pupate and emerge as adult butterflies or moths, but others take advantage of the protection of the cocoon or chrysalis to get them through the cold winters. Species such as the giant swallowtail create their protective coverings just before cold weather hits, usually hanging from a tree branch. When the weather warms in the spring, the adult butterflies and moths emerge as the first ones of the season. Not all butterflies and moths spend the winter as caterpillars. Some species, such as the European skipper, lay eggs near or at the base of plants the caterpillars can later use as food. The eggs spend the winter there, hatching only when spring arrives. Other species, such as monarch butterflies, migrate to warmer areas so adults can survive the winter, returning in the spring to lay eggs that hatch into caterpillars. Adult butterflies and moths who don't migrate typically die in the winter, although some species can survive in mild climates. Beautiful Wildlife Garden: Where Do Butterflies Spend the Winter?